Premium Compatible Label Tapes for the Brother P-Touch 1090 printer. The Brother P-Touch 1090 is a versatile, portable labelling machine ideal for home, school or the office uses. This labelling printer offers a wide range of possibilities with different options of printing styles. The printer has a slim design that makes it easy to handle and use even with just one hand. It weighs only around 0.317 kg that makes it an extremely lightweight machine. The compact printer measures only around 4.2 x 8.2 x 2.3 inches. It has an integrated cutter. This labelling machine features a large 1 line and 12 characters LCD display. It also contains function keys as well as ABC and 1-0 keypad. This labelling machine can handle different tape up to width 12mm. The Brother P-Touch 1090 label maker has quite fast print speed. With Brother P-Touch 1090 label tapes, it can reach up to 10mm per second. The printer delivers prints at a resolution of 180dpi. It can also handle a wide range of labels ranging from flexible ID to iron-on fabric. It features 178 built-in symbols and can multi-copy up to 9 prints. It also offers different features such as date and time labelling, cable labelling, deco mode patterns and built-in memory to save up to 9 labels. 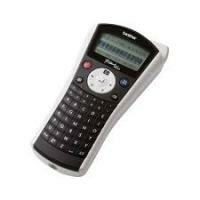 The Brother P-Touch 1090 handheld labeller has excellent and convenient features. This portable label printer delivers durable labels with Brother P-Touch 1090 label tapes and is ideal for indoor or outdoor use. However, batteries and an AC adapter aren’t included in the printer package. Q. The machine does not print or is printing blurred labels. What should I do now? Q. Can I use organic solvents to clean the machine? A. No, you should only use a soft, dry cloth to clean the labeler. It is not recommended to ever use alcohol or other organic solvents for cleaning the machine or its parts. Q. All my data gets lost. What is the issue? Why this happen to my label printer? A. Any data that is stored in the memory will get lost due to failure or repair of the labeler. Another reason that can affect is that the battery expires and no adapter is connected to the printer. Q. What is the maximum printing speed offered by Brother P-Touch 1090 for printing out labels? A. The label printer offers fast printing speed up to 10 mm per sec and prints at a resolution of 180 dpi. Q. What should I do if the Brother P-Touch 1090 Label Tape does not feed properly or got stuck inside the labeler? A. One must check that the end of the Brother P-Touch 1090 Label Tape feeds properly under the tape guide and the cutter lever is pressed while printing. Keep in mind to not touch the cutter lever during printing is under process. Q. Can I save my labels for later use? A. Yes, the machine has a built-in memory that can save up to 9 labels and can be recalled for printing at a later date. It is also possible for you to edit and overwrite a stored label. Q. Why does my machine display ‘Text Limit’? What should I do now? Q. What payment options are available, if I want to order Brother P-Touch 1090 Label Tapes from your site? A. If you have to make an order, you can make your payment using Laser Card, American Express, MasterCard or Visa credit card, Maestro, Switch, Solo or Delta debit card. When you purchase the Brother P-Touch 1090 Label Tapes or any other item on this site the payment will be hosted by Sage Payments to ensure maximum security of your credit/debit card details. Q. What should I do if the tape is entangled in the machine, or the top and base layers of the laminated tape are misaligned? When installing the tape cassette, just make sure that the underside of the tape cassette is completely touching the base of the compartment. Also, make sure that the end of the Brother P-Touch 1090 Label Tape is fed through the tape guides.